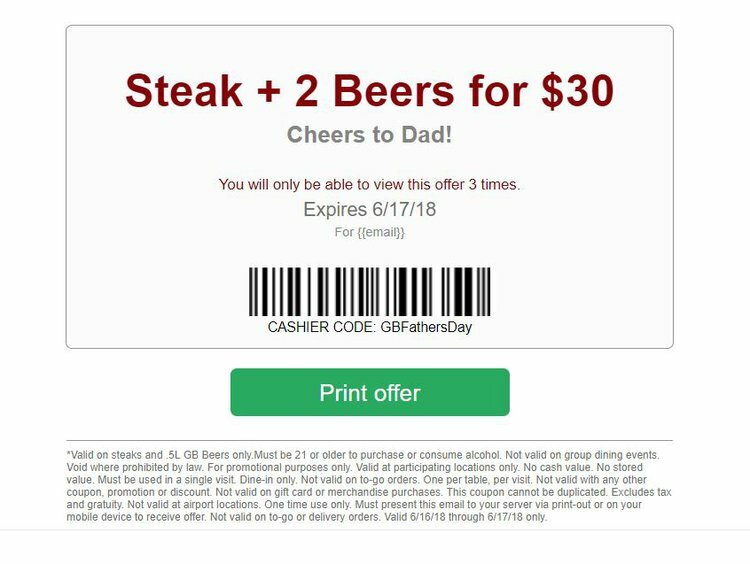 *Valid on steaks and .5L GB Beers only.Must be 21 or older to purchase or consume alcohol. Not valid on group dining events. Void where prohibited by law. For promotional purposes only. Valid at participating locations only. No cash value. No stored value. Must be used in a single visit. Dine-in only. Not valid on to-go orders. One per table, per visit. Not valid with any other coupon, promotion or discount. Not valid on gift card or merchandise purchases. This coupon cannot be duplicated. Excludes tax and gratuity. Not valid at airport locations. One time use only. Must present this email to your server via print-out or on your mobile device to receive offer. Not valid on to-go or delivery orders. Valid 6/16/18 through 6/17/18 only.